Heat a large skillet over medium heat for 5 minutes. Add sugar snap peas. Add enough water to cover the peas; cover. Cook until peas are bright green, about 3 minutes. Remove cover and continue to cook until water is evaporated, about 2 minutes more. 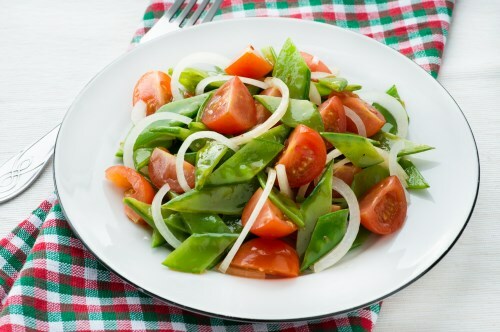 Stir tomatoes, garlic and onion powder into peas; cook for 3 minutes. Stir in lemon juice to serve. Optional: Thinly slice half of one onion and toss through the vegetables before stirring in the lemon juice, as pictured. Omit the onion powder if you perform this step.